When I saw this beautiful silver swan, I was immediately inspired. I knew I would be building a winter wonderland tablescape around this lovely bird. The funny thing is that I photographed this on my lovely lanai in Florida in wonderful weather. It is fun to dream about pretty snow when you don’t have to deal with shoveling it and walking through it. 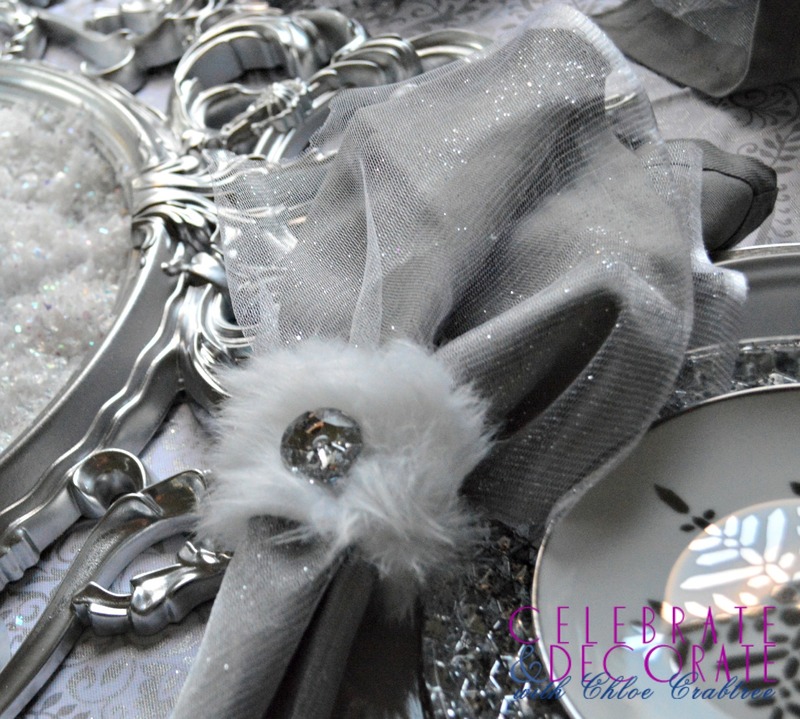 The glitter and shimmer of the swan, the crystal, the snow and the crystal accents on the napkin rings brings the magic of winter are expressed beautifully in this tablescape. At first I didn’t like the white fur wrap on the swan. I looked it over at the store trying to see if I could remove it. If I did, it would pull off a lot of the silver glitter. It actually grew on me, adds to the elegance I think. 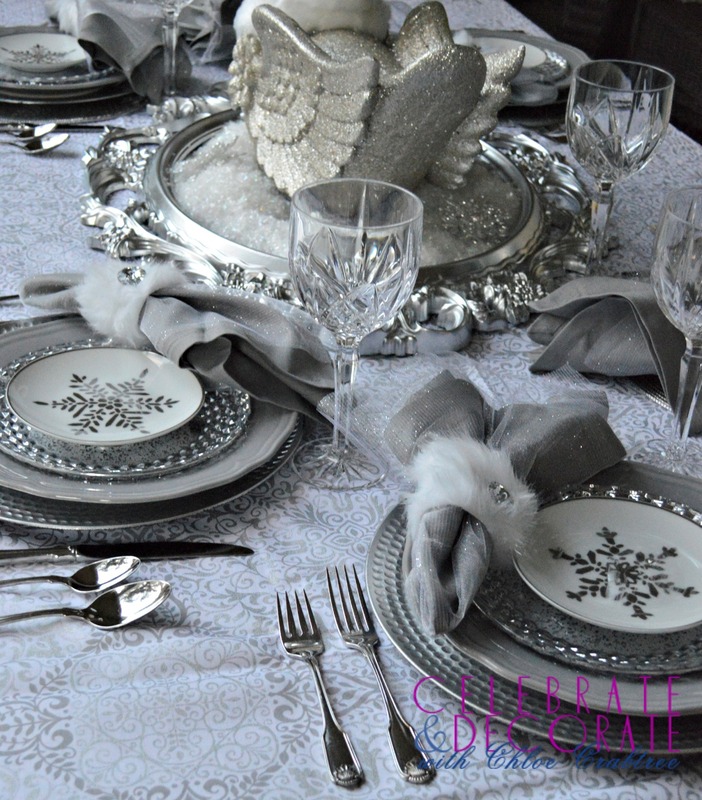 A lovely silver and white print tablecloth helped set the scene for this winter wonderland tablescape. The next step was to begin layering my dishes. Textured silver chargers were the base, to which I added some of my favorite grey dinner plates. You can see how I used these differently at my Coastal Ladies Luncheon. Next I added these fun silver salad plates that look a lot like mercury glass. I topped these with Target’s 2014 snowflake plates. These are available in this size, which I consider a bread plate or an appetizer plate, salad plates and dinner plates. I only got myself these little ones, since I like to mix and match more than being matchy, matchy. I have a love/hate relationship with this artificial snow. I love how it looks. I love when it you spread it on a table and it looks like it just fell there, but I really don’t like it when it gets all over the place, on the floor, on the carpet, just everywhere. I had this great idea to “frame” the snow on this tabletop. I love these Ikea Ung Drill frames. They are so versatile. I painted this very one pink for the Alice in Wonderland Baby Shower I hosted. I got out my chrome paint and gave the frame a wonderful makeover. I filled the frame with the artificial snow which kept it a little bit under control. 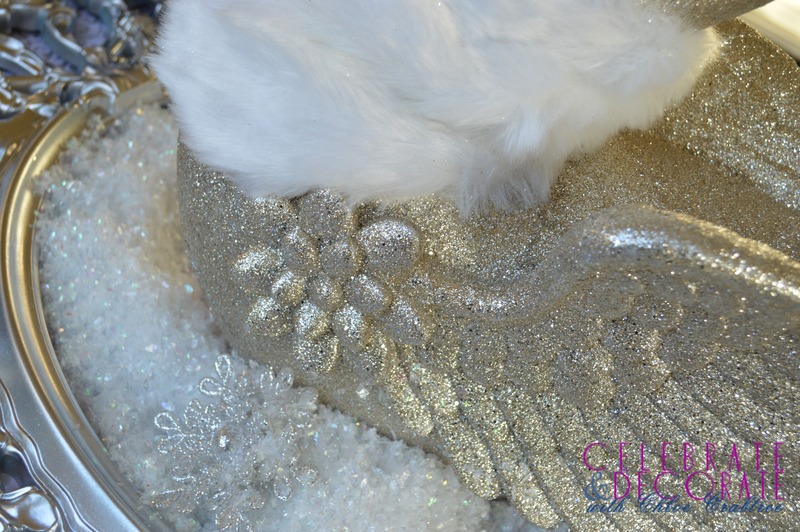 I added some sparkly snowflake ornaments and settled my swan onto its snowy bed. A table like this needed napkins with special treatment. 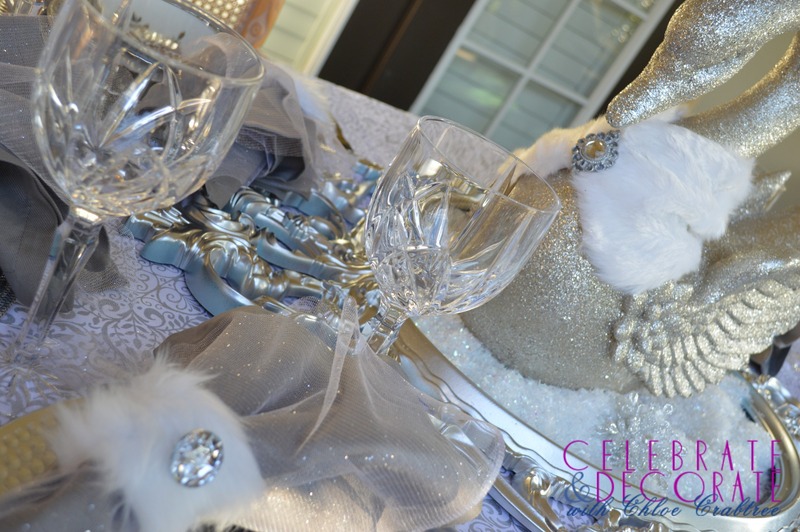 I used lovely grey cloth napkins and used some shimmery fabric as an overlay. 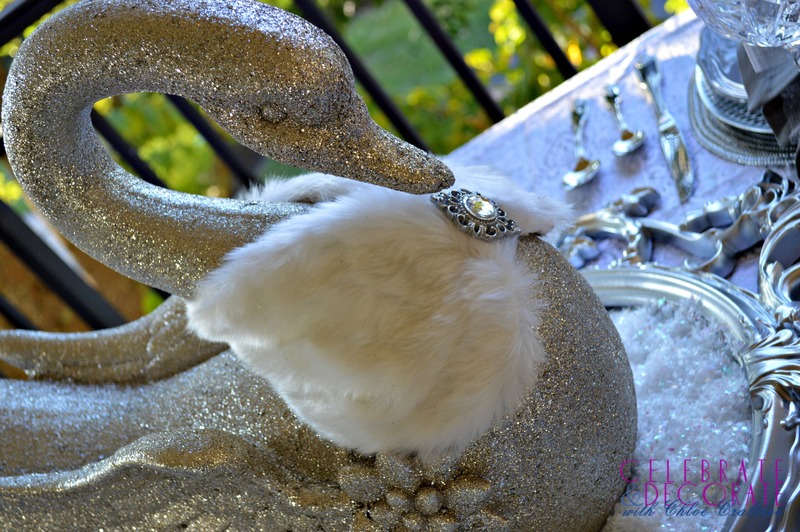 Since I had finally embraced the fur on the swan, I made my own matching napkin rings. I used some fur trim, stitched it together and added a sparkly button to each one. Of course the stemware had to be crystal. These are wine glasses I have that are the Brookside pattern by Marquis by Waterford. I could not be happier with how my lovely table turned out. I will be recreating this many times, it is just perfect for Winter. This swan won me over, even with her white fur wrap. I grew to love her and the lovely silhouette she made on our table. Creating a lovely table like this and serving up some delicious hot food might make you more willing to tolerate the cold weather! 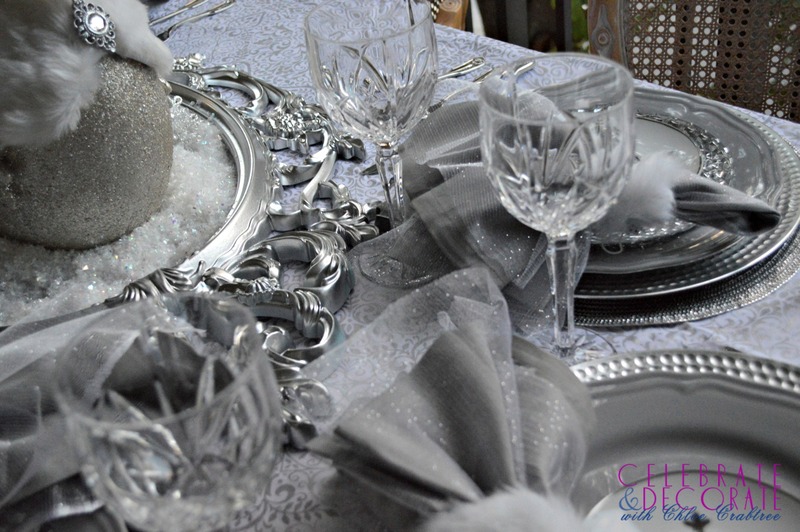 Truly a Winter wonderland tablescape! This is absolutely beautiful. Love the fur napkin rings. Where did the swan come from? Bet you get a lot of comments about the swan. Thank you Gayle! I made the fur napkin rings and will be posting a tutorial on them shortly. The swan came from Home Goods and was the only one I have seen! Beautiful, I m especially fond of that beautiful swan. Hugs! Thank you Katherine! I fell in love with that swan! What a beautiful tablescape, the swans are my fav!!! Would love to have you stop by this week to share!! Wow! Your table looks beautiful Chloe. I love the swan and I actually like the wrap on her and the broach gives her that extra glam factor. I was going to ask where you found her, but I saw in a previous comment Home Goods. Gotta love Home Goods. I try not to go in there too often because I always find some little treasure. Thank you so much Lou Lou Girls! I will party with you again! Everything is so pretty. My favorite thing is the napkin ring, though. Does that surprise you? They remind me of hand muffs from back in the day! 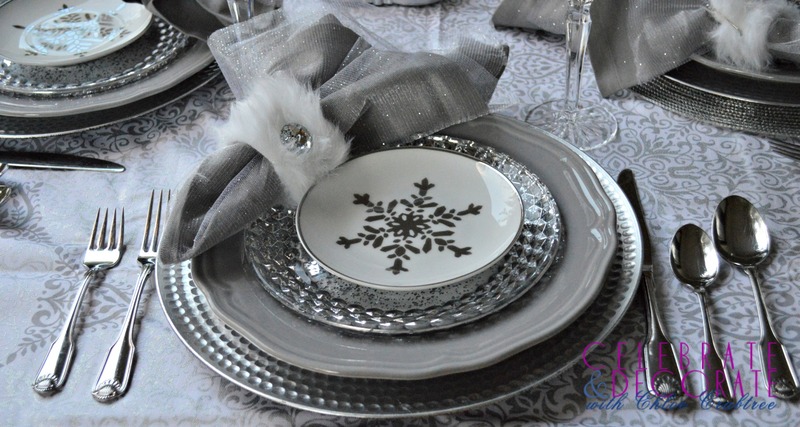 Your snowflake plates are perfect, too. Lovely! Thank you Kim! I loved those muffs! I am doing a blog post on how to make those napkin rings tomorrow! Stunning tablescape! It is almost ethereal….and magical. You did a beautiful job…. So many beautiful things combine to make a stunning table. 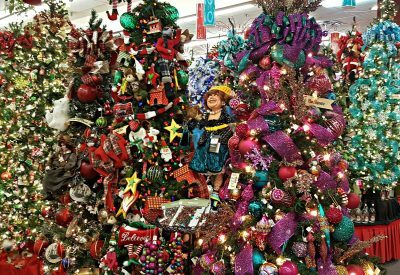 It’s like entering a fairy land. BTW, I used the same table in black for my table. I gave you a FB like, would appreciate yours, too. I look forward to seeing more from you. Thank you Linda! 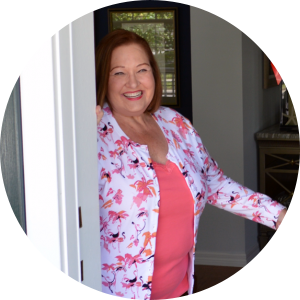 heading over to check you out on FB! Susie, You are so sweet. Thank you. I know that snow is crazy! Beautiful and elegant table, Chloe! I’m so glad you left the white fur wrap on the swan! 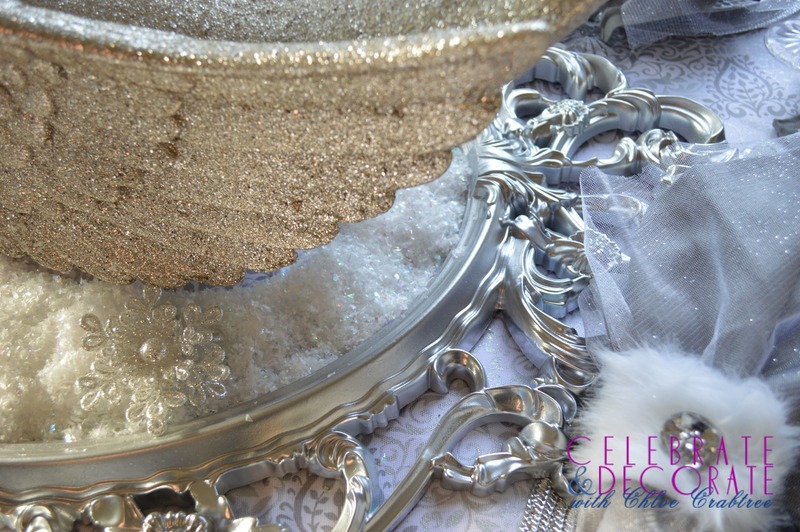 It makes it all the more unique and you were brilliant to make the “matching” fur napkin rings – they add the perfect accent to your wintry table! The snowflake and gray plates are terrific. Great idea for the frame to “catch” the snow! 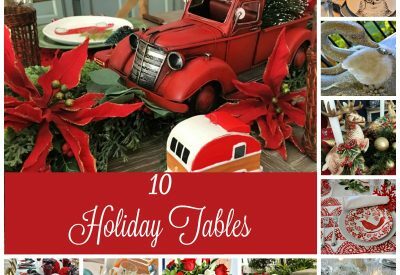 I really enjoyed seeing this tablescape – Fantastic! My thoughts exactly! Did u tell us where u found the swan….not like I have any place to store it! I love the elegance of your table, up north in the frozen tundra, I’ve been opting to more rustic and whimsical tablescapes of late. Thank you Debbee! I was aiming for a combination of elegance and whimsy and so happy to hear that came across. 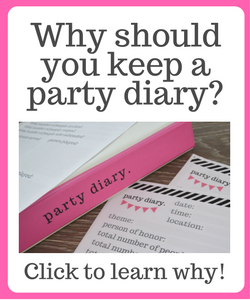 Pingback: How do you come up with ideas for a blog post, a craft or a party? Just beautiful! I love all of the sparkle and feathery textures . . . lovely! Thank you Lauren, I always love to combine and work with different textures when designing tablescapes. Well, all I can say is breathtaking! RS, thank you I really enjoyed putting this opulent and whimsical tablescape together, so happy to hear that you liked it! Cindy you are so sweet! Thank you for stopping by to check it out. such a pretty and when you made the napkin rings it pulled the whole fur stole idea together, smart thinking. i live in FL too and agree it is fun to only dream about cold wintery weather while sipping some wine on the lanai! I’m cleaning ours up today to be ready for visiting snowbirds arriving for the weekend. a tip on the fake stow that I do is use epsom salts. when I’m finished I pour them on the palm trees because that’s what they need to green up. Thank you Pamela. Great tip about the epsom salts, I am going to try that! How lovely is this, Chloe? It is such a beautiful swan and his fur wrap is perfect. This reminds me of Swan Lake. Thank you Barbara, and I had not thought of that theme. I suppose it could be repurposed for a little girls ballet themed Birthday Party too! Oh my, I love your fabulous table scape. You did an excellent job with this theme. 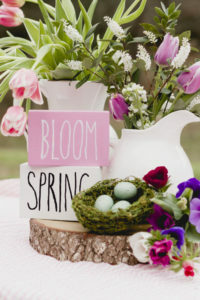 Now it’s time for you to come to our home and help make our table look fabulous to. This is beautiful Chloe! Love the swan and the idea with the snow and the frame. I love the white fur on the swan-what a pretty piece. This is definitely a winter wonderland! Thank you for all your positive feedback Liz, it is so appreciated! What a beautiful table and a stunning swan centerpiece. I love white with silver. It makes such an elegant table. The filled in frame with snow is such a wonderful idea. At first, I thought it was a mirror. It dresses up the swan even more. Stunning. Thank you Marsha! 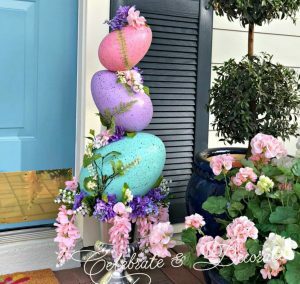 Although I love working with both real and silk flowers for centerpieces, it is always fun to think outside the box and create something different for a change. Gorgeous, Chloe! Swooning over your swan and the lovely plateau it is sitting on! 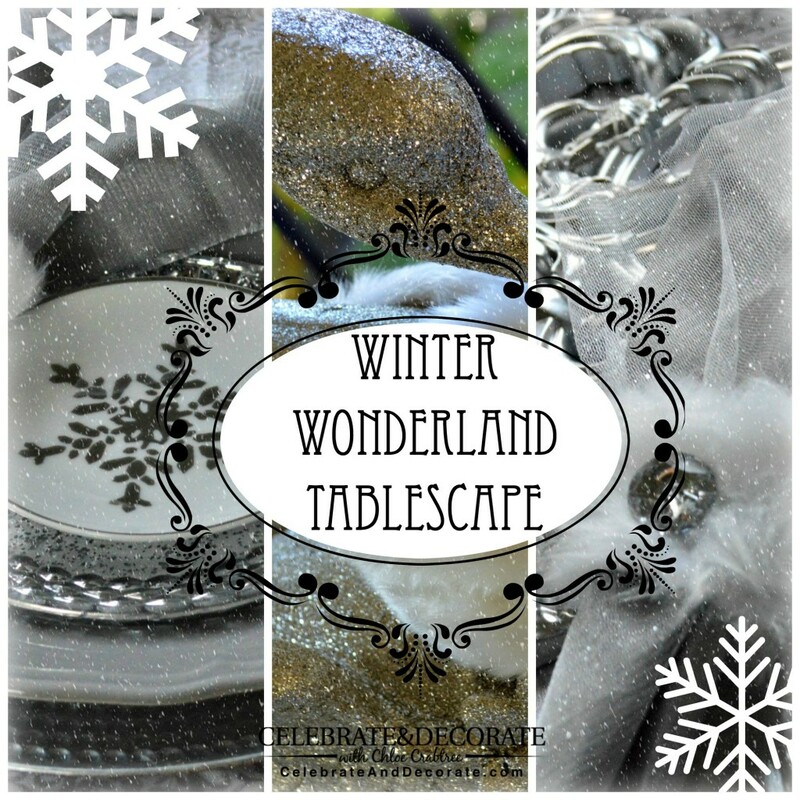 Truly, a beautiful winter wonderland table. Love your plate stack and gorgeous crystal! I’m at a lost for which superlative to use and maybe when I pick my jaw up off the floor I can think of something. Iove the swan and her fur. Adding fur napkin rings really ties the two together. 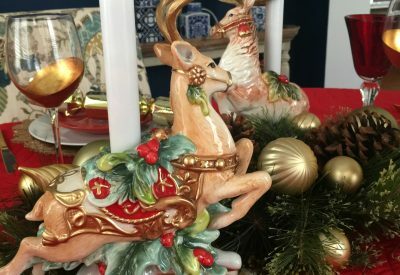 You’ve styled the ultimate winter wonderland table. Oh Sandra, you are too, too kind. I guess it is easy to fantasize about the ice and snow when you don’t have to live with it! 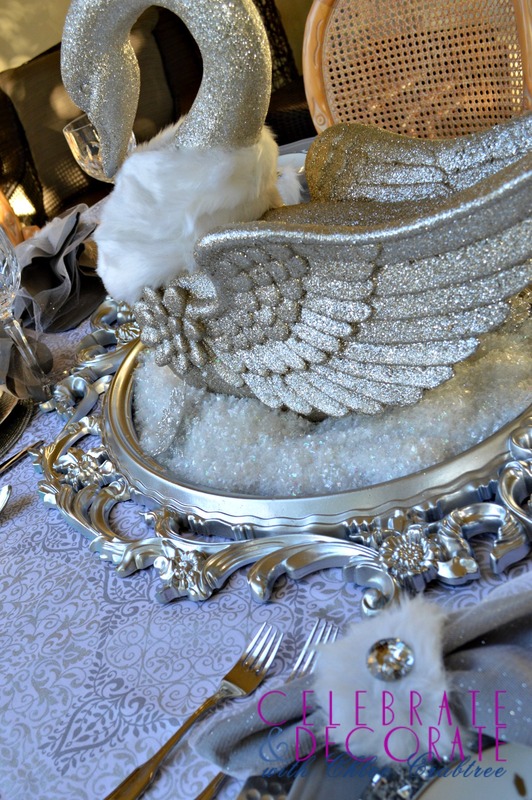 Beautiful tablescape — very Swan Lake. I love all the silver!